There is a snap of bitter cold weather across the country, with snow in many places and low temperatures that have dropped below zero at night time. But weather like this also has its beauties and its benefits. Some nights this week, the sky has been clear with few clouds. Over the past year I have rediscovered the joys of living in area where low light pollution opens up a night sky full of stars, and again I am reminding myself of the pleasures that could come from learning the names of the stars and the constellations. Despite the cold weather and occasional rain, during my walks through Askeaton this week, by the banks of the River Deel and out into the countryside, I have realised that Spring has already arrived. I am still wrapping up warmly against the biting cold and the occasional rain showers, but the flowers are beginning to burst through the soil, and daffodils are bursting through on the roadsides. Irish people traditionally date Spring from Saint Brigid’s Day, which fell a week ago [1 February]. my sail I’ll let go. 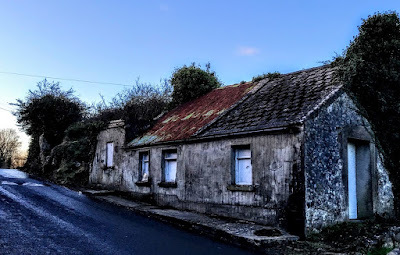 But, despite the poetry, despite the longer evenings, and despite the daffodils, it is still cold on these daily country walks in Askeaton, and occasionally rainy. Has Spring truly arrived? So, if I am going to be particularly pedantic astronomically, although I still have to learn the names of those stars and constellations, then a week after 1 February and Saint Brigid’s Day, Spring has arrived in Askeaton. Handsome thoughts from Askeaton. 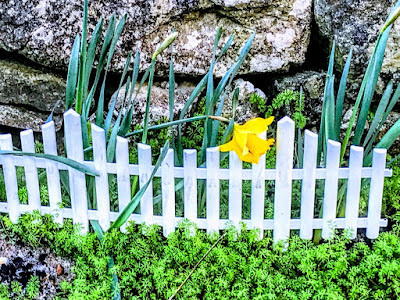 Like, the wee white fence enhances the daffodil. It's the good influence of starlight, only visible to people who live in places like Askeaton.